The Serpent finally goes to Auction! The long awaited Stretch Serpent Auction was here and gone faster than you can say "Dam I missed It! 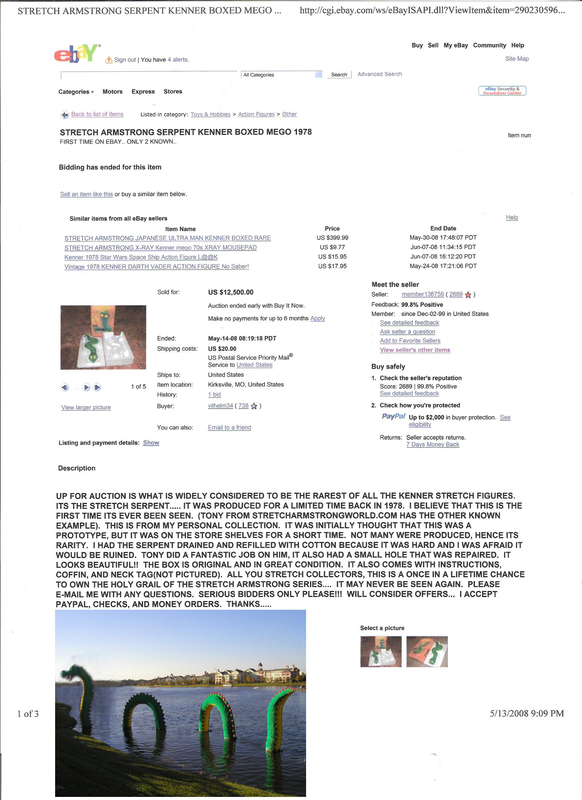 ".The Serpent auction lasted only a few minutes as a resident from the United Kingdom grabbed this very rare opportunity .The Serpent is among the rarest of all the stretch figures and one had to know that if ever the Serpent were to come up for auction,it would demand its value.Here is the actual auction page from this most brief encounter with the Serpent as it surfaced from the murky depths of Lochness only long enough to be scooped up by a very lucky collector, making him one of only three people in the world to have acheived the Alpha 7 Status,(the first 7 origianl stretch figures ever produced). Alpha 7 is a most immpossible level of stretch collecting to reach mainly becasue of the Serpent extreme rarity.There are only 2 Stretch Serpents in the world at the present time with not even a clue to a possible third Serpent! The Serpent AKA "The Lochness Creature", AKA "Cecil the Sea Serpent" is so rare that the mere thought of owning it can bring one to there very knees if thats what it took to get it. Yes,there are only two ways to obtain the Stretch Serpent my friends, dish out the cash and take it like a man, or dream of one. Although both of the only 2 Serpents needed some minimal repair,we should be more than happy just to still have them around in any condition because in the stretch kingdom its better to have an imperfect Serpent than no Serpent. The Serpent brought in a whapping $12,000 dollars making this the most valuable stretch figure next to the 15,000 Batman! Looking back 8 years ago when I started collecting stretch figures, I hadnt thought about the Serpent since the last time I saw one in 1980 on the shelves in Hills Department Store. After over 25 years I almost forgot the Serpent existed untill I met a friend online named Eric who refreshed my memory. At that time, Eric had the only Serpent in existence. He was kind enough to send me a box copy that I propped up on a shelf in my bedroom. Every night I would look at that dam box and think to myself, there is no way I will ever find this Serpent.Then about 3 years later, the Serpent found me! I recieved an email from someone that said they had another Serpent. I had to wait 4 weeks just to see the pictures to verify that he was in fact real. After what felt like years, the pictures finally came in and I was blown away! I immediatley made him an offer he could not refuse and the rest was history. Today we still have only these 2 Stretch Serpents as one of them changes hands from one collector to another. I can tell you first hand that the new owner is well deserving of this relic and will most likely remain with him for a long long time. the world awaits,will we ever see another Serpent?